A repeated refrain from Remainers is that the UK is “too small to survive alone”. Putting aside the absurdity of such a claim when the UK is the 5th largest economy on the planet, Brexit Facts4EU.Org brings you the facts – from a country known for straight-talking. We compare the claims of the EU – and their Remainer supporters in the UK – with the reality, using the example of Australia. The information below comes from the the Australian Dept of Foreign Affairs and Trade (DFAT) and from the latest data from the Australian Bureau of Statistics (ABS) this week. The EU is fond of making statements which make it sound important. The reality is that EU trade figures are simply a total of the trade which each of the 28 member states do with other countries around the world. What the EU Commission is less fond of saying is that the UK accounts for a significant chunk of the business which “the EU” does globally. For a country like Australia, if you take out the UK, the EU is a much smaller proposition. 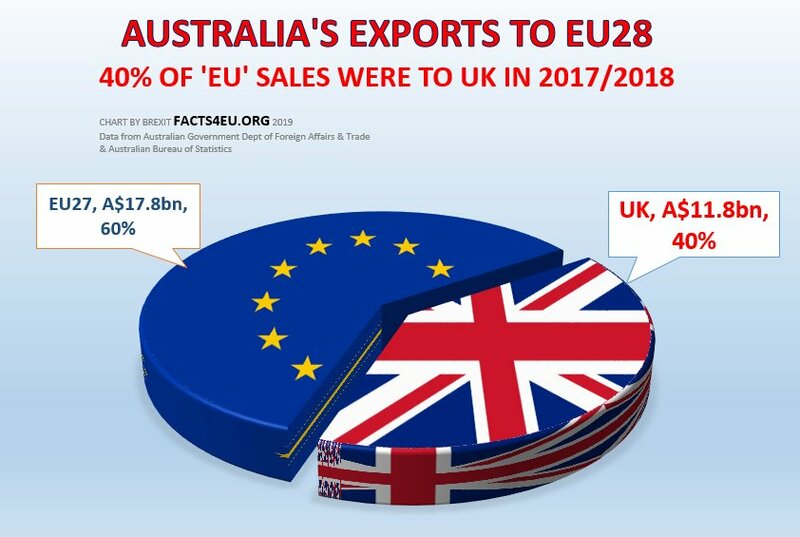 If you look at Australian exports, the UK accounts for 40% of Australia’s sales of goods and services to the EU28. 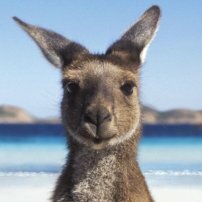 So for Australia, when the EU28 loses the UK and becomes the EU27, the European Union plunges in size from nearly $AUD 30 billion down to less than $18 billion. The good news for Australia is that the EU’s loss is Australia’s gain. When the UK is freed from the EU’s common commercial tariff and protectionist policies, it will become an even more attractive destination for Australian companies selling their goods and services. Naturally it’s still worth Australia pursuing a trade deal with the EU27, if it can get them to reduce their protectionist high tariffs and the other barriers on so many goods that Australia would like to export to them. But let’s look at the facts – the EU takes years to agree trade deals. Canada’s started in 2004 in Ottowa - that's 15 years ago - and it still hasn’t been ratified. Next let’s look at the balance of trade between Australia and the EU. In 2017/2018, it was negative to the tune of A$47 billion. In other words the EU is selling Australia 47 billion dollars worth of goods and services more than Australia is selling to the EU. However, 91% of this trade imbalance is down to the EU27, not the UK. 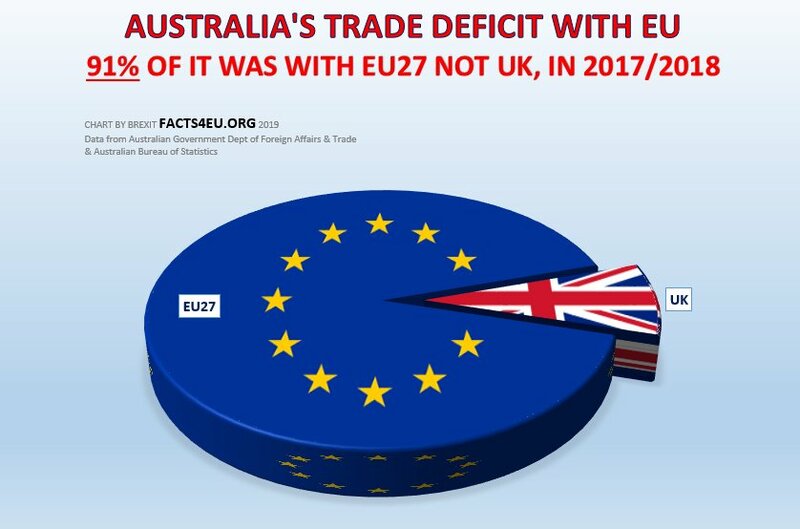 So, the UK accounts for 40% of Australia’s sales to the EU but the UK is responsible for only 9% of the trade deficit. We're presenting a simple, positive, and factual case for a true Brexit on 29 March 2019. Please contribute today. Everything we do costs money and we really need your help right now. What about the ‘EU’ foreign investment in Australia? 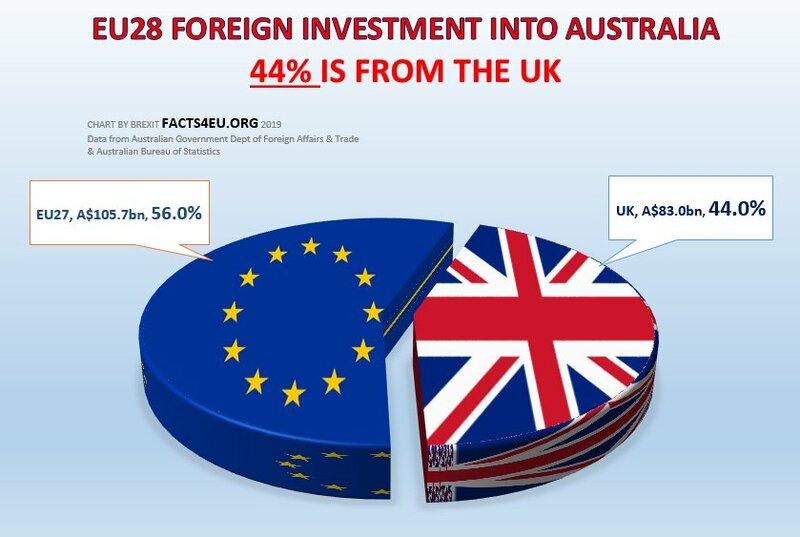 Nearly 45% of ‘EU’ foreign investment in Australia is actually from the UK, not the EU27. The UK accounts for almost half a trillion Australian dollars of foreign investment in Australia, according to the latest figures. The UK is the third-largest investor in Australia after the USA and Japan. Remain politicians are forever telling us that the UK simply can’t survive on our own. We are unsure why they continually seem to want to present this anti-UK perspective, other than that they wish to employ any argument they can to stay in the EU, regardless of all the facts contradicting this. Above we have taken one example – that of Australia – and shown how the importance of the EU is massively reduced once the UK leaves. We have used official Australian government statistics, because we like going to the raw data. 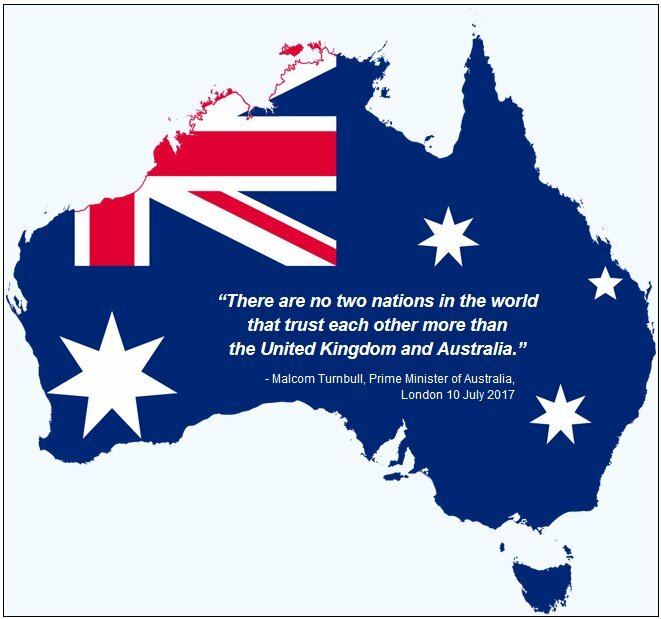 Looking at the facts we have presented above, is it any wonder that the Australian Government is one of many around the world who have expressed enthusiasm at the prospect of doing trade with a newly-independent United Kingdom? Aside from our UK readership, we hope that Australian readers find the above interesting. We kept this in Aussie dollars, to make things more transparent for our friends down under. It's regrettable that the EU continues to misrepresent itself to other countries. Without the UK, the EU27 are a significantly different entity, economically and in many other ways. We have in the past three years asked the British Government to make this clear to the populations of other countries, but sadly they have failed to do so. Another flaw in remainers' logic here is that the EU takes a very lot of our money in net terms, unrelentingly, year in, year out. How does that help us stand up in the world? Thank you for the great charts. It shows very clearly the real weight of the UK in the Australian trade example. Considering the three key factors: size of export market, trade deficit and overall ease, pleasantness and history of relations it's obvious that we'll do great business together. Disappointing as ever, TM doesn't have a clue who our real friends are, and is way too busy sucking up to the EU - who wouldn't think twice to stick a knife in the UK's back. I really do take my hat off to Facts4EU who collate these readily available informations and put them into clear, concise format for anyone to understand. You cannot be clearer than this on yet another remoanian lie. Scot, "TM doesn't have a clue who our real friends are, and is way too busy sucking up to the EU - who wouldn't think twice to stick a knife in the UK's back". If you ask me a high proportion of the Westminster 'bubble' wouldn't think twice to stick a knife in the UK's back. We live in very sad and dangerous times for the health of our once great country. I only hope and pray that it survives the onslaught from within and the eu.